Copyright 2012 eContent Management Pty Ltd. Although spirituality and religion are potentially divisive and controversial, we cannot avoid discussing them. Certainly in mental health these topics are viewed with mistrust. However, in recent times strong evidence has been presented to suggest that incorporating spiritual care in treatment plan helps recovery, reduces relapses, and improves quality of life. Mental health patients have consistently identified spiritual needs as an important issue to them and several studies have found that spiritual care positively contributes to symptom relief and general well-being. Therefore, as part of providing holistic care, mental health patients should be offered a spiritual assessment followed by attempts to include their spiritual needs incorporated in care planning. 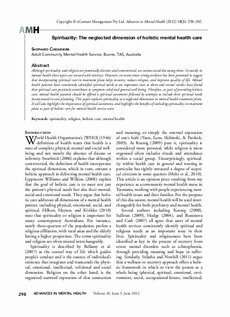 This paper explores spirituality as a neglected dimension in mental health treatment plans. It will also highlight the importance of spiritual assessment, and highlight the benefits of including spirituality in treatment plans as part of holistic care for mental health service users.